I haven’t written much about the Canucks since the end of the playoffs, mostly because it was so BRUTAL to reflect on. But I’ve never wavered on my opinion that it was a great season and a great run. And as a fan (after a week or so of highly intensive therapy) I’ve been hugely grateful for how far we went. Better to suffer in mid-June than mid-April, right? I owe a large and belated swath of ‘thank yous’ to the thoughtful people who sent condolences by email and tweets (god, it’s like a funeral in so many ways! ), empathizing for our team’s loss (or maybe just feeling sorry for me, their token “Canucks fan” friend). Whatever it was, it made for a lovely epilogue on the season, and I’m grateful to everyone who had a few nice words to say about my favourite team. Going to the Stanley Cup Finals was an epic experience as a hockey blogger, and I loved it. Full props to the Bruins and their fans for their amazing accomplishment—but to all the Canucks fans out there, we had a few minutes of fun, didn’t we? Who Owns the History of the Winnipeg Jets? While it was clear that a huge number of Winnipeg fans wanted their team’s original name back, I really didn’t think it was going to happen. But it seems it just might. As Elliotte Friedman said earlier today, “the power of public pressure” apparently rules the day. But how logical is this decision? For instance, you have to wonder: Do the “new” Winnipeg Jets (Jets 2.0?) now re-hang their old retired jerseys—Bobby Hull and Thomas Steen—from the rafters? Whatever people might think of it, Phoenix claims those players as their own, and the jerseys are hanging in Arizona these days. Do both teams get to claim this history, even though neither player was ever part of this new Jets team? Given that Philly seems to be blowing themselves up today—dropping Richards, Carter, and a few million in salary (and hey, with a sad 106 point season, who can blame them? 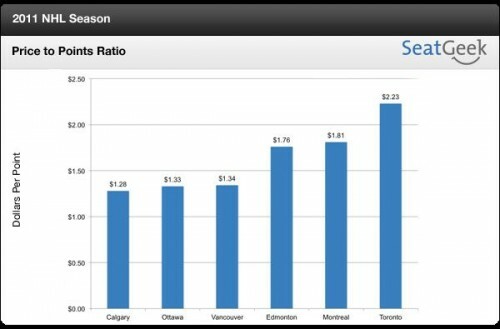 clearly a pile of under-performing deadbeats…) while picking up an extra $51 million investment (holy goalie, batman! )— it seemed like a good time to post the Canucks roster situation. With a new salary cap blowing over $64 million, plenty of dealing will be done in the coming days and weeks. Canucks.com recently put up a handy, comprehensive list to everyone on their roster, and their current contract terms. All the info is below, but in short: the good/bad news (depending on your favorite flavor) is that you have Roberto Luongo till 2022, and Kevin Bieksa until around.. well, next Friday. Depending on how big a share of that $64 million he’s looking for, anyway. Maybe John Wall should stay away from baseball. Wall plays for the Washington Wizards. His owners, the Leonsis Family, also owns the NHL Washington Capitals. 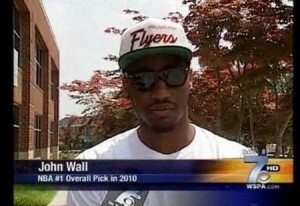 Wall is pictured wearing a Philadelphia Flyers’ hat. You may remember, the subject of hats had the NHL’s head office a bit miffed during the Stanley Cup Finals, when some Boston Bruins players were appearing in the media wearing the Red Sox hats instead of NHL gear. The modern world of sports branding… a hat ain’t just a hat anymore. —This is Our Vancouver is a PR campaign looking to fix Vancouver’s badly tarnished image after last week’s riots. (Of course, when it comes to mob-attack behavior in the aftermath, those families are on their own…). Incidentally, someone thought it would be fun to light up a car on a busy street where I live on Vancouver Island this past weekend, too. One very big and dangerous fireball was the result. So the ripple-effect of last-week’s stupidity has legs. Lucky us. —When Nicklas Lidstrom’s new 1 year contract extension was announced this morning, KK’s website hits bounced up about 6,000% over the previous hour. (Maybe a slight exaggeration, but still, On The First Day, There Was Much Joy in The Land.) That guy’s eventual retirement is going to kill these poor people. Canada: How Much Are You Paying Per Point? The couple whose passionate kiss was captured in a now-iconic photograph of the Vancouver hockey riots are an Australian and Canadian who have been dating for several months. The photo shows Scott Jones and Alex Thomas in a fervent embrace on the street between a police line and another officer in full riot gear. Taken by Rich Lam for Getty Images, the picture has been splashed all over the Internet and in media outlets around the world. In the aftermath of last night’s rioting, the Vancouver Police Department estimates that some 150 people were injured, some severely, including a man who tried to jump 12 meters from an outside concourse of Roger’s Arena to the sidewalk below. A terrible night. While police said it was mostly young thugs responsible for the mayhem overnight, an equally young crew turned up in jeans and rubber gloves, some with Canucks jerseys, all carrying plastic garbage bags. Dozens of remorseful and dismayed commuters crowded around the smashed and plywood covered display windows at the flagship Bay store, a historical building that was the first focus of rampaging looters Wednesday night. Someone had tacked a rough, hand-painted sign that read: “On behalf of my team and my city, I am sorry.” People waited in line to sign it. Mayor Gregor Robertson said there has been an outpouring of support from citizens. “People coming downtown to try and help cleanup, trying to get our city back,” he said as he toured the damage. Many hundreds of people deserve enormous credit and thanks for contributing to this clean up. Organizing and documenting the hard work have been Twitterers @VancouverClean and over on Facebook, numerous pages (most prominently, Post-Riot Cleanup - Let’s Help Vancouver). NOTE: Updated at bottom, with video. Update: More video—Henrik Sedin and Daniel Sedin. Q. Alain, did you feel good about tonight the way the game started? COACH VIGNEAULT: Yeah, I thought, you know, our guys were ready to play. But you know what, at the end of the day, I’m not going to analyze this game right now. Everybody is disappointed. Our players gave it their best shot. At the end of the day, you’ve got to give credit to where credit is due. Boston played a real strong game. They have great goaltending and they were able to score a couple of tough goals around our net and they deserved to win.